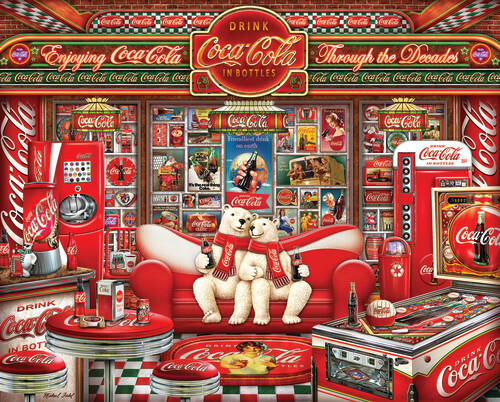 Explore the many years of Coca-Cola collectibles and nostalgia with Springbok's 1,000 piece puzzle, "Decades". This puzzle includes all things Coca-Cola - trinkets, machines, signs, and even the famed Coca-Cola polar bears! Enjoy Coca-Cola through the decades with this delightfully refreshing puzzle. What a great puzzle the picture on the box or on the website doesn't do it any justice. I have framed this puzzle and would recommend this puzzle to anyone.